UPDATED: Sat., July 14, 2018, 4:57 p.m.
Two gray wolves forced a seasonal U.S. Forest Service employee into a tree on Thursday. The employee was doing a research survey in the Okanogan-Wenatchee National Forest, according to a U.S. Fish and Wildlife Service news release. The employee was preparing for stream surveys in the area. Before being treed, the woman attempted to scare the two wolves, members of the Loup Loup pack, by yelling, waving and spraying bear spray in the animals’ direction. After those attempts were unsuccessful, the woman climbed a tree and called for help around 12:30 p.m.
She was roughly 3 miles from the Tiffany Spring Campground in the Pasayten Wilderness of the North Cascades. According to the Gazette-Tribune, the woman was 30 feet in the air. “The deputies were advised that if they arrived on the scene and the wolves were still surrounding the female they were to shoot the wolves on sight,” Okanogan Sheriff Frank Rogers told the Tribune. 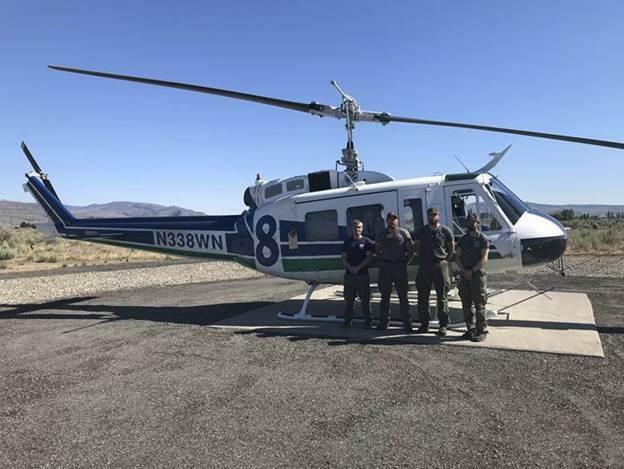 A Department of Natural Resources helicopter based in Omak, Washington, responded. The helicopter is mainly used for fire-fighting efforts. According to Hilary Franz, the head of DNR, the helicopter arrived on scene within 14 minutes of the call being placed. The crew of four landed and helped the woman. Members of the helicopter crew declined an interview request via a DNR spokesperson. Wolves are federally protected in the western two-thirds of Washington. A Loup Loup pack den site is less than a mile from where the incident occurred. GPS collar data from Thursday evening shows at least one adult wolf from the Loup Loup pack in close proximity to the area where the incident occurred, according to a U.S. Fish and Wildlife Service news release. Biologists from the Forest Service and the Washington Department of Fish and Wildlife investigated the area Friday. They determined that where the researcher was treed was a “rendezvous” site and the wolves were likely acting defensively to protect offspring or food sources. Rendezvous sites are home or activity sites where weaned pups are brought from the den until they are old enough to join adult wolves in hunting activity, according to the release. The researcher did not have access to wolf radio-collar information, a Forest Service spokesperson said. Forest Service staff often work alone in the field and receive training to do so, said Okanogan-Wenatchee National Forest acting public affairs officer Deborah Kelly. “They also take precautions in those situations, like having a radio, cellphone or satellite phone, and carry bear spray, for example,” she said in an email. Kelly said the seasonal employee did not check in with the district ranger immediately prior to going into the field. Checking in with local staff is considered best practice, Kelly said. The woman received some minor scrapes from climbing the tree and was shaken up after the encounter, Kelly said. Wolves are rarely aggressive toward people. Former Spokesman-Review outdoors editor Rich Landers encountered wolves while hiking with his dogs last summer. For his tips on hiking in wolf country spokesman.com/blogs/outdoors/2017/jul/27/video-hiking-safely-dogs-wolf-country/. For tips on staying safe around dangerous wildlife spokesman.com/stories/2018/jul/08/staying-alive-insight-on-surviving-encounters-with/. At the end of 2017, the state held at least 122 wolves, 22 packs and 14 successful breeding pairs, the Washington Department of Fish and Wildlife estimates. That compares with a minimum of 115 wolves, 20 packs and 10 breeding pairs reported at the end of 2016. Correction: The woman treed by the wolves is a seasonal United States Forest Service employee. A U.S. Fish and Wildlife Service news release incorrectly stated that she was a student. The story has been corrected. Published: July 13, 2018, 1:13 p.m. Updated: July 14, 2018, 4:57 p.m.